Last year, Facebook users found out that Mr. Mark Zuckerberg had the power to delete Facebook messages on the app which led them to ask Facebook to introduce the feature for all users as well. Now, Facebook Messenger unsend feature introduces for users just like WhatsApp. Facebook launches unsend feature in his Messenger. This feature will allow his all registered users to delete their messages within 10 minutes from Chat thread. This feature works just like the unseen feature of the WhatsApp. This feature gives his users two options. 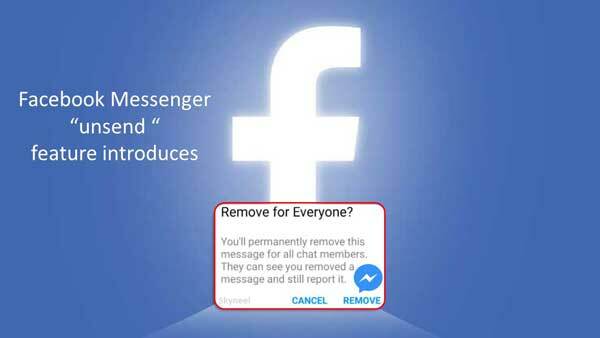 The first ‘Remove for Everyone’ and second Remove for You’ are also available on Messenger. Selecting Remove for Everyone replaces your message with text that the message has been removed by you. Facebook was working behind the scenes to create a Facebook Messenger unsend feature for his all registered users. This feature would allow you to permanently delete messages which you’ve accidentally sent to others from both your side of the conversation and theirs. The unsend feature is live now in the Facebook Messenger Android mobile app. Facebook Messenger unsend feature working is that you only have a 10-minutes-long window to delete your messages. Once complete the 10 minutes, the message is stuck in the conversation permanently. If you have updated version of Facebook, you will be able to easily use Facebook Messenger unsend feature at your Android phone. To do this job you have to take following simple steps. Step 1: Open your updated Facebook messenger. Now, tap and hold on the message which you want to delete which bring up the options you have for that message. Remove for You:This option allows you to remove the message only from your Android phone. Remove for Everyone: You can use this option to remove the send message from everyone Android phone. You just tap the one option which you like and confirm the same. If you choose remove for everyone option will remove the message from both sides. Now, there is no regret after sending an accidentally wrong message to a person on Facebook messenger. As per the latest Facebook messenger unsend feature you will get the power to unsend a wrongly sent message.